Specific gravity determinations were made on fresh and desiccated samples of cerebrum from hydrocephalic rabbits. Hydrocephalus was induced by injection of silicone oil into the cisterna magna. In the normal cortical gray matter there was a density gradient. Hydrocephalus was accompanied by a significant increase in the specific gravity of cortical gray matter at 3 days and 1 and 4 weeks after induction. In the latter two periods there were also significant increases in the specific gravity of white matter in the corpus callosum. The specific gravity of the desiccated tissues changed insignificantly. The changes are interpreted as representing water loss throughout the whole cerebrum except at the ventricular surface as a result of hydrocephalus. 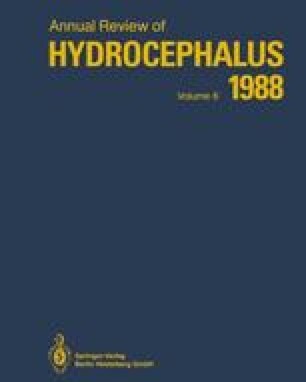 We conclude that short term volume changes in experimental hydrocephalus were due to the loss of water from the cerebrum.